If the recommendations of the Telecom Regulatory Authority of India (TRAI) gets approval from the Broadcasting Ministry, you could soon hear news on private FM channels too! The sources of news for these FM channels have to be one of All India Radio, Doordarshan, authorised TV news channels, UNI, PTI or other authorised news agencies. Well, now state owned FM Channels like Vividh Bharathi 102.9 FM and FM Rainbow 101.3 FM broadcast news in bytes or for a brief moment. If the Broadcasting Ministry gives its node to the TRAI's proposal, this could begin a new era in news broadcasting. Now, with FM Radios becoming extremely popular in Metros and Tier II cities in the country, this could well change how fast people get to know the news and have their opinion. It is not that private FM channels are not broadcasting any news stuff now. They are, with those score updates of cricket matches and some wacky but interesting news to keep the listeners tuned. Also, some untraditional news like jam busters or reporting of traffic jams in various parts of the city in peak hours. How these jam busters by FM channels played their role in reducing traffic jam needs to be surveyed! So, now we might have FM Stations which broadcast news too, along the usual film songs. In Bangalore, there are already 7 private FM Radio channels - Radio City 91.1 FM, Radio Mirchi 98.3 FM, Radio One 94.3 FM, Radio Indigo 91.9 FM, Radio Big 92.7 FM, SFM 93.5 FM, Fever 104 FM. It would be interesting to see how these channels would make the best use of this license, if they get one. With very competitive FM Radio market in place, sometimes these channels have used the same trick to get more audience. One example for this would be the back to back playing of 3 songs with no advertisements in between. Radio Mirchi, Radio Big and SFM, all use the same concept with different names. Now, dont ask me who started this first! ‘Akasha Ishte Yaakideyo’, the song with western tunes, set the tone for the first hit of the year in Sandalwood, ‘Gaalipata’. Last year, it was raining songs with western tunes in Gandhinagar. If ‘Onde ondu saari kanmunde baare’ of Mungaaru Male renewed this trend off late, Hudugata with Jessie Gift’s music continued it to a larger extent with many songs with western tunes – Ommomme heegu aaguvudu (sung by Alisha Chinai), Mandakiniye Nee Sidilina kidiye(sung by Jessie Gift himself, original tune of Malayalam song Lajjavathiye from '4 The People'), Stylo Stylo, Eno Onthara... and then came the Krishna highlight – Satyabhame baramma(sung by Gurukiran), which was a unique blend of western and classical tunes, composed by none other than the guru of music here, Gurukiran. Guru started or rather renewed the interest for these tunes/music with films like ‘A’, Upendra. How can one forget the famous song – Idu one day matchu kano from ‘A’. Here, Upendra’s lyrics too played its part in making the song popular. Well, the song was not fully western. It is the song where you have cricket commentary too as a background score! Sachin Tendulkar’s heroics in the field in commentator’s words filled the song with all the ‘josh’! Guru even sung a song in that film which was completely westernized – 2000 AD lady ye ultra modern! Khushi for which film he composed music continued this trend. Going back further, Shankar Nag’s Santhoshakke haadu santhoshakke (sung by SPB) even today forms one of those party numbers. Then, we have our own crazy star, Ravichandran with his versions like ‘yaare neenu roja hoove, yaare neenu mallige hoove’. Usually Kanglish lyrics forms an integral part of this type of music like – Stylo stylo, and most songs written by Upendra. But Jayanth Kaykini’s Akasha Ishte yaakidiyo, Mungaaru Male’s Onde ondu saari are exceptions for this rule. And now we have this rap album coming up in Kannada from a band called 'Urban Lads', based in Basavanagudi, Bengaluru/Bangalore. Found this article on Karnatique, a blog by Banavasi balaga. Click here for more details. So, we have now, the best of both worlds – humming soft tunes like Minchaagi Neenu Baralu and also josh filled Akash Iste yaakideyo and that too in the same film! Sadhanakeri is some 5km away from Dharwad, the district centre. ‘Bendre Bhavana’, a memorial in memory of great Kannada poet and Jnaana Peetha award (which is the highest civilian honour in India for Literature) winner Dr. D R Bendre or Da Ra Bendre is here. 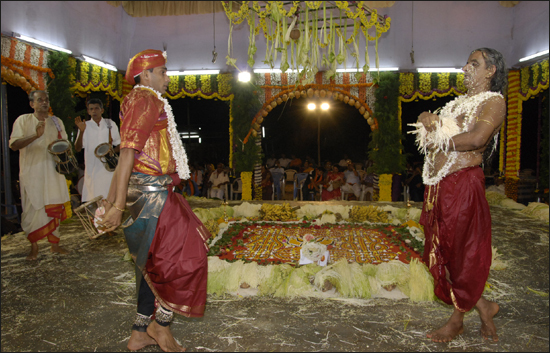 Nearby is the home of Dattatreya Ramachandra Bendre, ‘Shri Matha’. When we reached Sadhanakeri it was already past 5 pm and visiting hours for Bendre Bhavana is till 5 pm. But when we requested the personnel there, he agreed to let us in. Bendre Bhavana is full of rare photographs from Dr. Da Ra Bendre’s life and portrait paintings of the great poet. Certificates received by Dr. D R Bendre – Padmashree award from Govt. of India, Doctor of Literature from Mysore University, Bachelor of Arts(B.A) and Master of Arts(M.A) from University of Bombay and Doctor of Literature from Karnatak University, Dharwad are also on display. Quotes, extracts from his poems too filled the memorial with greatest Kannada poet’s memories. One of his quotes, I would like to mention here is – Rasave Janana, Virasave Marana, Samarasave Jeevana. After visiting the Bendre Bhavana we went to see Dr. Bendre’s home which is adjacent to the memorial. For Da Ra Bendre, who wrote with pen name Ambikatanayadatta, Sadhanakeri was a place of inspiration with his poems praising the beauty of nature here. Bendre’s home too is a place of memories where you can find – things used by the great poet in his life time, dresses he used to wear, mementos received by him from various organizations and the Jnaana Peetha Award certificate along with the memento. You can also buy the books written by Da Ra Bendre from here. Written on the walls of the home are the poems by the Vishva kavi. In the premises of the house you can find the Ambikatanayadatta Vedike, a stage for literary discussions and Varakavi Dr. Da Ra Bendre Adhyayana Kendra, centre for research on works by Bendre. In front of the house is the vast Sadhanakeri Lake. No wonder, Bendre was inspired by these wonderful surroundings. When we went to see this lake, the time was perfect; sun was about to set. Sunset at this beautiful lake is really awesome. Add to this different types of birds flocking towards the lake. Picture is perfect, nature at its best for the man to watch and enjoy every moment of it. Hakki Haaruthide Nodidira? ( Have you seen the birds flying) – goes one of Bendre’s poems. If the evening brings you these best moments then what about the mornings when the sun is rising? One of Bendre’s most famous poems describing the mornings soothes you at every word – Moodalamaneya muttina neerana erakavaa hoida, Nunnanerakava hoida…Baagila teredu belaku haridu jagavellaa.. toida hoyitu jagavella toida… I was found wanting to translate these lines into English which describes how morning sun rays have made the world wet! This poem was adapted to a Kannada film, Belli Moda. With Vijaya Bhaskar’s music and S Janaki’s voice this song is made ever green. It was a very nice feeling to be in these surroundings, far away from the busy and tense city areas. After several unsuccessful attempts to get that perfect picture of flock of birds flying towards the lake, we were on our way back to Dharwad carrying sweet memories of Sadhanakeri. Updates : How to disable transliteration in blogger? If you are not using tranliteration you can disable it using global settings. For this, go to Settings section in your blogger dashboard. Then in the lower half of this page you will find Global Settings. You can enable/disable transliteration facility as shown in the figure below. I had been planning to go for Stona 2008, an international granites and stone fair held in Bangalore. So, on last Saturday, 09th February 2008, I went for the show accompanied by my cousins. Stona 2008 was held from 06 – 10 February 2008. First three days of the show were reserved for business delegates and on the last two days, 09th and 10th Feb, general public was allowed view the exhibition. 2006 was the last time when the show was held. This time show was big with 2100 stalls (from 400 exhibitors) compared to 100 stalls in 2006. Exhibitors from Italy, China, Turkey, Egypt and other European countries were also present in the show. Bangalore Palace Grounds near Vasanth Nagar, where the show was held was busy with activity. Red carpet welcome was at its truest sense when the whole Palace ground was covered with the same. People flocking to see granites, marbles, tiles and various creations from the same was a common sight. It being a second Saturday had attracted many people from the city to witness the stone wonders. We started our Stona 2008 journey by visiting pure business stalls where information about the company and stones they dealt with, along with sample stones were on display. This as you would expect did not arouse much interest in us. I had seen photographs of some of the best stone creations in Stona 2008 in news papers, so was eager to see that. After visits of some similar business stalls, we saw those stone creations like – idols of Lord Ganesha, Lord Krishna and other gods, animals like elephant, lion, themes like a giant pistol tied at the tip saying No War etc. Stone creations have been fascinating men from pre historical times and in this modern age it was no different. Lord Ganesha was the favourite of most of the artisans at Stona 2008, with most of the idols being of Him. Lord Buddha seemed to be the next favourite. Apart from stone creations there were stalls which exhibited machinery which were used to give the artistic shape to a mere stone. Also on display were power tools, abrasives, house keeping chemicals, grinders etc. State owned companies in stone business from Karnataka and Andhra Pradesh too had their stalls. Andhra Pradesh map formed from various tiles available in the state was artistic. Apart from the business representatives, there were people buying stone work for that artistic and aesthetic look in their homes. One of the great attractions of the show was the train made out of granite by Granite Products Corporation. But the biggest attraction of the show, what I felt was the Shilpagram. Shilpagram was a congregation of some of the best artisans, where they used to display their works. Idols of gods, animals, temples, abstracts were on display. Main attraction here was the giant Lord Ganesha idol which was on sale for some 35 lakh rupees. Fine carvings made on the idol for over 3 years by the artisans were the prime reasons for the price. Artisans from north, south, east and west of India were present in Shilpagram showcasing their talent. Truly it was an enjoyable experience in all, seeing the brilliant stone works on an otherwise usual Saturday! For all the photos from Stona 2008, Bangalore click on the slide image below. Ira, a village in Bantwal taluk in Mangalore had achieved some thing big to be noticed by the national weekly, India Today. I was scanning through the latest edition of India Today dated February 11, 2008. It was then I came across this article about Ira, which said not only Indian media but international community too took notice of this small village of about 1300 families. Well, there is a lot of publicity involved whenever an environmental initiative is taken up by some organization in the cities. But more often end result is not so impressive. May be it is too much to ask from the already stressed city dwellers. Anyway, here is a village which keeps itself free of plastic/polythene bags. Here is one village which is all clean and fully literate. Now this is something which will attract the national and international media attention. Visits by UNICEF team (which consisted representatives from Indonesia, Nigeria, Zambia and Zimbabwe), National Rural Development Department team, a 28-member team from Kerala, representatives from various districts from Karnataka to study the development here, bear testimony to this fact. This inspiring story of Ira village began when it implemented Center’s Sampoorna Swachata Andolana or the total sanitation project in 2005. Active participation by the people of the village, women in particular, made it a success. After success of this scheme, anti plastic drive began. People were asked to refrain from using plastic and dump which they have to create plastic mountains. This collection of polythene bags was then sent to Bangalore for recycling. ‘Apna Desh’, an initiative started by former Deputy Commissioner of Mangalore, Mr. Bharat Lal Meena, 10 years ago, said to have made a big impact in the lives of the people here. Success has its own rewards. Ira which is surely serving as model to many villages around the world, has won the Nirmal Gram Puraskar from the Union Government and will definitely earn many more in the future. For role models in keeping our environment clean, green and plastic free, we need not look outside our nation. It is in our own backyard. Just the strong will of our people is needed to create more Iras in our country. Though Kasaragod lies in Kerala, it has been included in this series of Mangalore beaches purely because of its proximity to Mangalore and a bit of history. In fact, Kasaragod was a part of South Canara (present Dakshina Kannada or Mangalore) district till November 1, 1956. Kasaragod is 50 kms away from Mangalore, to where you can reach within one hour of bus journey. Cricket connection: 50 km road stretch from Mangalore to Kasaragod is a national highway, NH 17. On the way, you will be finding a junction named Kumble, 40 km away from Mangalore. Yes, the same Kumble you will find in the name of Anil Kumble. Though present Indian Test cricket team’s skipper Anil Kumble, is settled in Bangalore his ancestors were from this place, hence the surname. Kasaragod beach or Kadappara (Kadappara in Malayalam means sea shore) beach, as it is called here, is at a distance of 3 kms from the town center. On reaching the place you will find numerous boats sailing in Arabian Sea for fish hunt and when a boat reaches the shore you will be able to buy the fish directly from fishermen, fresh from the sea!!. You can also witness how the boat once coming back to shore, is moved to a safe distance from the sea by the fishermen.Coconut plantations near the shore, typical of Kerala, will sure catch your eyes.Kasaragod Lighthouse, maintained by Department of Lighthouses and Lightships, Government of India, is at this place. Stones have been laid on the sea shore to avoid the soil erosion, which can be seen even in beaches in Karnataka. Sea shore is not wide as the fishers’ colony is at a close distance from the sea. Though lacking in beauty this beach is calm and serene. This beach does not get listed in Kerala tourism destinations, since the place is marked for fishing. And nearby CPCRI beach scores over this in attracting visitors and is famous for its sunset. But to watch the boats in action, you should surely come to this place. Will not call a must visit to the travelers as there is also a historical Bekal fort beach, 15 kms from Kasaragod town. But if you come to Kasaragod and you have no time to explore other places, then this is a good place to enjoy your evening. As there are hardly any restaurants nearby, it is better you carry with you some snacks and drinking water. Here is how you can reach Kasaragod beach? Mode of transport – Private buses between Mangalore and Kasaragod, from Kasaragod town take an auto rikshaw. 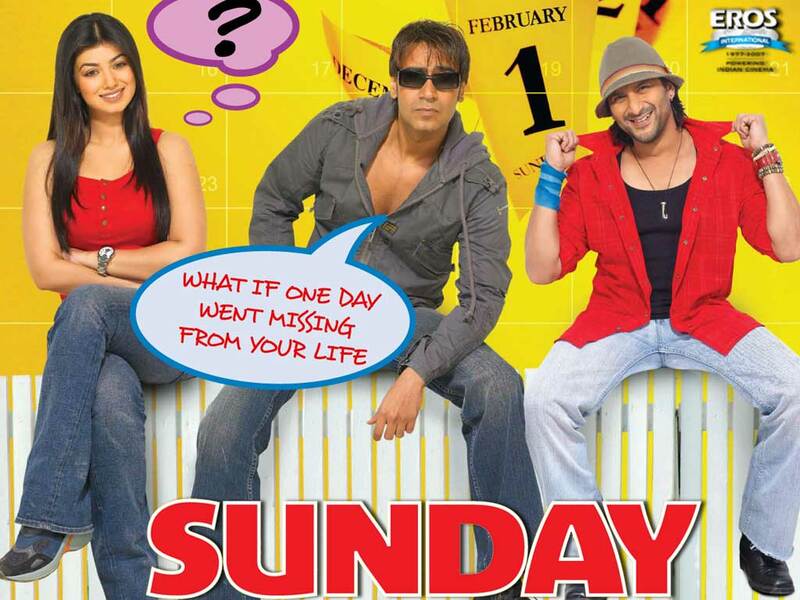 “What if one day went missing from your life?” ask the posters of this Hindi movie, Sunday, a suspense thriller. Rightly so, first half of the film puts you into some puzzling situations. But rather dull second half takes the excitement out, though not fully. Comic relief from the jodi of two best comedians in Bollywood now – Arshad Warsi, whose presence in the entire film arouses laughter and then there is Irfaan Khan, the most versatile actor presently. First half of the movie filled with some good comedy scenes and some mysteries in the story, which remain unsolved. Stuffed with some unnecessary song and fight sequences. Ajay Devagan’s role as a bully, seems he has been stereotyped with such roles after Golmaal. Second half in which answers to your puzzling questions comes quite easily without much twist. Plot begins with the murder of a girl in Delhi, with finger of suspicion pointing too many. Rajvir Randhava (Ajay Devagan) is a cop and Seher Thapar (Ayesha Takia) is a dubbing artist in an animation movie company, who lends her voice to some interesting animation characters. Seher keeps forgetting things and this time it is a whole day, Sunday. Arshad Warsi, who plays a taxi driver, keeps asking Seher to pay the rent claiming she had hired his taxi. But Seher fails to recognize him. Irfaan Khan, who is a drama artist, keeps chanting bhoot whenever he sees Seher. She is also frequently attacked by a gang, whose leader has a stop-n-play, girlish voice which is another attempt to arouse laughter. Rajvir, who falls in love with Seher, solves the mystery behind all these happenings, quite expectedly. Ajay Devagan has continued his bullying role in several films now with this role quite similar to the one he played in Masti. Ayesha Takia looks gorgeous throughout the movie. But real highlight of the movie is the duo of Arshad and Irfaan who outdo each other in making the audience laugh. Though first half of the movie keeps you guessing about what the story is all about, second half reveals the secrets quiet easily. Story is not run of the mill and can be given a watch for the new things it presents. Found this video on youtube in which Bollywood/Hindi cinema(whichever you feel appropriate) queen Aishwarya Rai speaks in Tulu, her mother tongue, in Kannada Rajyotsava function in Mumbai held on November 14,2007. Aishwarya Rai, who was born in Mangalore, later moved to Mumbai with her parents. At a time when one forgets his/her roots once he/she attains success in life, Aishwarya Rai is an exception. Here is the translation of what she spoke in Tulu on that day - "Thank you all for welcoming me with your love and affection. I could not attend this function all these years because of my busy schedules. This year, organizers had informed my father about the function, 4 months in advance. I thought this is the best occasion to attend along with my husband. Definitely this programme would have been recorded. I would carry a cassette / CD of this function and show it to my husband. He was telling how children gave a good cultural programme today, showcasing our culture."